We are excited to welcome you to Melbourne! Let me know if there is anything I can help you with. Please contact me at h1564-gm1@accor.com or 0477 331 812. 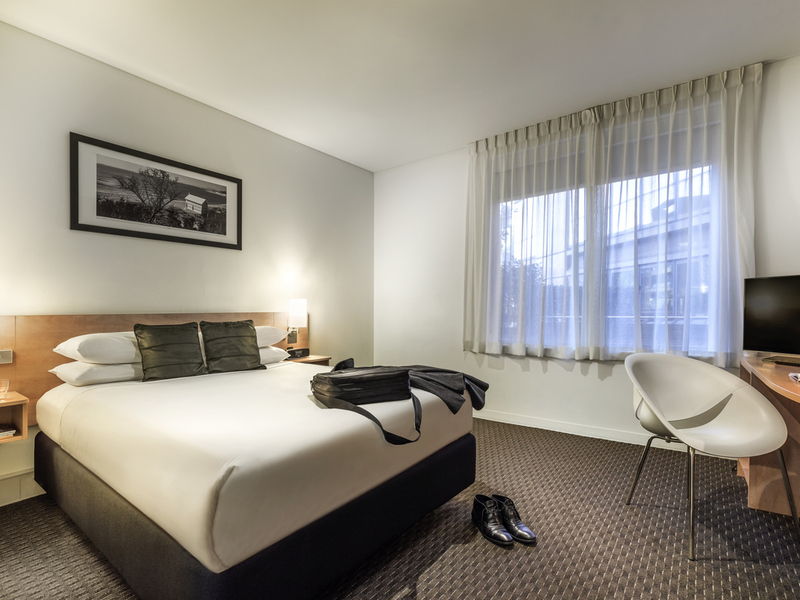 Offering great value city accommodation, Ibis Melbourne is located in an ideal position just a few minutes walk from the famous Queen Victoria Markets, the legendary Lygon Street restaurant quarter and the central shopping district of Melbourne. The fully refurbished new look Ibis Melbourne offers 250 comfortable rooms including one and two bedroom apartments and WIFI internet connection, plus a lively restaurant and bar. Conferencing facilities for up to 300 delegates are also available. With its central location and range of convenient facilities and features, ibis Melbourne is the ideal choice for both business and leisure travellers. For business travellers, the hotel provides easy access to the CBD, versatile conference space for up t o 300 delegates, and a Business Centre with Wi-Fi enabled computers and printer access. This Melbourne hotel is also perfectly placed for leisure travel, with many of the city's top attractions, restaurants and public transport options within easy reach. Just a ten minute walk from Melbourne CBD and five minutes from Melbourne's shopping district, ibis Melbourne is within easy reach of the best of Melbourne. Public transport, Queen Victoria Markets, IMAX, the MCG and Rod Laver Arena are all closeby. Stylish and comfortable, guest rooms and apartments at ibis Melbourne Hotel and Apartments provide the perfect place to retire to. Each room is tastefully appointed, modern, and includes an ibis Sweet Bed, an LCD TV, an iPod docking station, and basics su ch as tea and coffee making facilities, iron, hair dryer, safe and fridge. This Melbourne hotel also features spacious one and two bedroom apartments, complete with kitchenettes and separate lounge areas for guests who need more space. MyRoom by Thomas: Who's Who in the Zoo, Its YOU! Guest Access from car park is not acceptable. Driver access to and from parking lot is awful. On check In wrong room number was given so we carried all of our luggage and a baby to the wrong room had to come back down again and get correct info from reception. Lighting in room is awful. Room given had no natural light. Room acoustics were bad. Positive- room was clean. Prior to booking hotel reception phone was unanswered a number of times a when trying to reach to make changes. On several occasions line was disconnected. Very frustrating. The hotel was a base and did the job. Check in was friendlyish. Noone did anything outstanding. Room was adequate. Housekeeping poor. Only done twice in 6 nights. By late afternoon if it hasn't been done by then..then don't bother. We were very happy with family mini-break stay at Ibis Melbourne. The apartments were clean and comfortable and suited us perfectly to accommodate 7 adults and 3 children. I called the hotel several times in the month leading up to our stay with various questions and the staff who spoke to me on all occasions were very helpful and pleasant. The staff at reception and in the restaurant were also excellent. The rooms were well kept and very comfortable, and the service was also amazing. The Assistant Manager who checked us in came across as unwelcoming and unfriendly. He said our Accor Gold upgrade was to a high floor and then when we got to the room my wife was horrified when people in the other building were very close. This was was sorted out very effectively however by the manager Ben who provided excellent service and upgraded us to a much better apartment. The rest of the stay was fantastic. The room was excellent, spotlessly clean, and the staff were friendly. The location of the hotel is good being close to both Elizabeth St and Swantson St. The Markets are also nearby. The breakfasts in the restaurant were excellent and the service great. Comfortable beds and pillows. Friendly staff, quiet room. Minimal cleaning done during stay, did not even wipe down basin or clean dishes but did get clean sheets after 3 days which was great. As I had come to Melbourne for an appointment at the Australian Conservation Foundation premises in Leicester St., The Ibis Hotel was a convenient location. Also a shuttle bus stops outside at set times during the day, making it easy to return to Southern Cross station for the XPT back to NSW. Being from country NSW (Wagga Wagga) , and not familiar with Melbourne, I considered your hotel had a good location, with good service. Location is decent in terms of access to City centre. Rooms were neat and clean. We appreciate that. However, the bed quality was a bit let down. Breakfast buffet was pretty decent. Needs to improve on the variety of the spread. We really enjoyed our stay at the Ibis. Our room was very clean and comfortable which we appreciated. The room was quiet, the linen was white and fresh, and the bed comfy so we slept well. We appreciated being able to park there too. Being close to the Vic market was ideal for us, and we were easily able to get to our show using public transport. The cost of the accommodation was reasonable. No real problems only it would of been nice to get into room to freshen up after flight as we were heading out,it was only 1.30 and check in is at 2 but still. Overall a good experience, but I think some improvement can be made to the cleaning of the rooms. Stayed for six nights - apartment was adequate to my needs. However wished I could open a window (don't like air conditioning) and despite having a window it looked out onto a side of a building. I couldn't tell if it was sunny or not. Also no tea towel supplied but dishwash detergent was. As per usual a great stay. Front desk is good / all staff has been friendly and check in is efficient. I really appreciated the strawberries/blueberries in room as welcome gift. Great idea to add the healthy option. Couldn’t resist them. Room - a little TLC will be needed in months ahead. Restaurant - still hit and miss. This time I was told I couldn’t get a discount on my food bill. I only selected an entree , which was actually more expensive than some of the mains. However was told the discount was only for mains. Which I know from previous experiences is not true. Either way it was only a 4$ discount so not worth the fuss; but either honour the accor plus program the way it is intended or don’t. Fortunately: more important check in / out experience and feeling welcome is great.